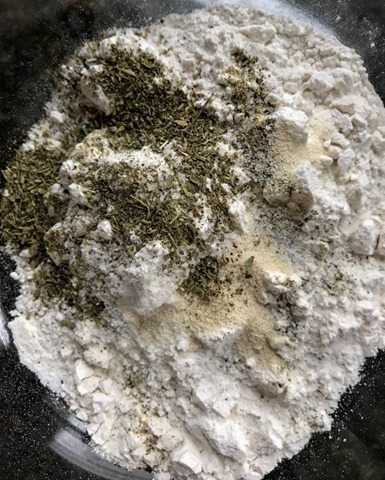 I think we all can agree that pizza is the best food (pizza dough might be the most frequent recipe here on Domestocrat). So I won’t be offended if you have doubts about this recipe. I certainly did! Until I tried it. I also converted John too, and he’s got very high pizza expectations. Traditional, pizzeria-style dough this is not. 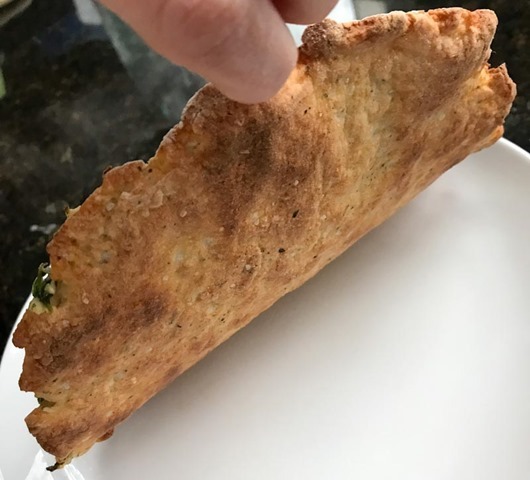 But it’s a really creative alternative that is lower in calories and carbs, doesn’t require any rise time, and can be just as versatile as any other dough (it can be pizza, flatbread, calzone, etc). 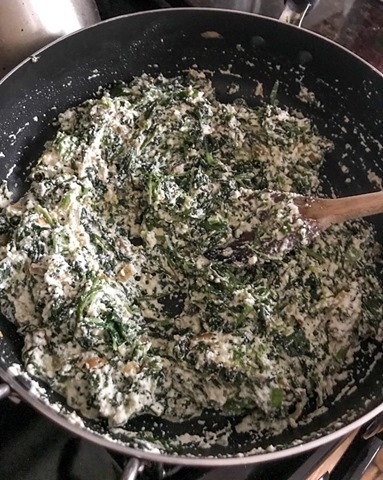 One last thing – stick around until the end because there’s a bonus recipe in this post for my current favorite pizza topping: creamy spinach, kale, and ricotta! Nutritional information: 520 calories, 0 g fat, 32 g protein, 102 g carbs. 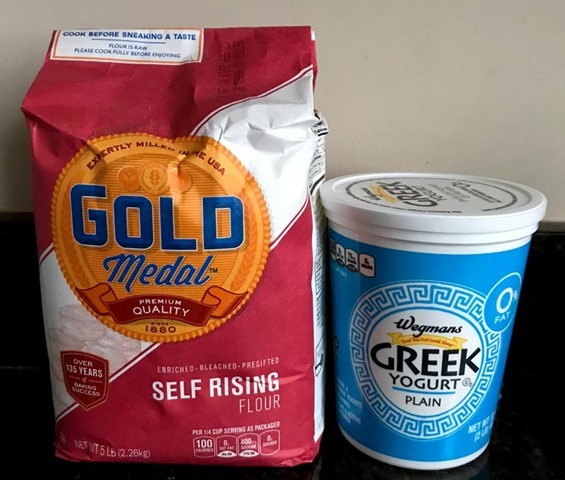 These figures are for the whole recipe; individual serving stats depend on how you portion the dough. Here are your two ingredients! Couldn’t be any simpler. 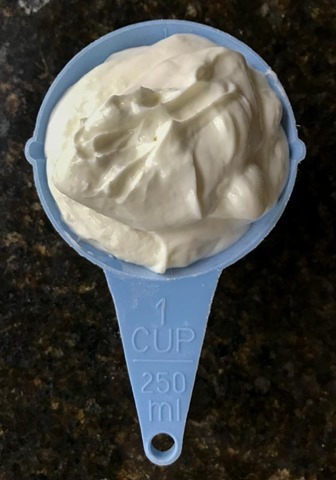 I prefer 0% fat greek yogurt but feel free to use whatever you like. 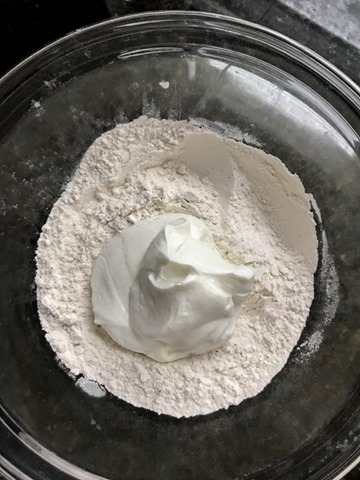 There are two steps in preparing the dough: 1) mix all of the dry ingredients together (flour + spices) and 2) then mix in the greek yogurt to form a dough ball. 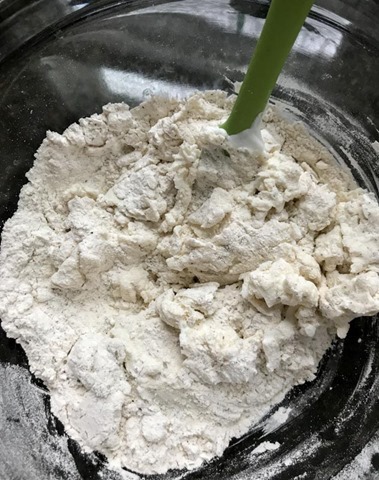 Towards the end of the mixing, I like to get my hands in there to make sure the dough is thoroughly combined. 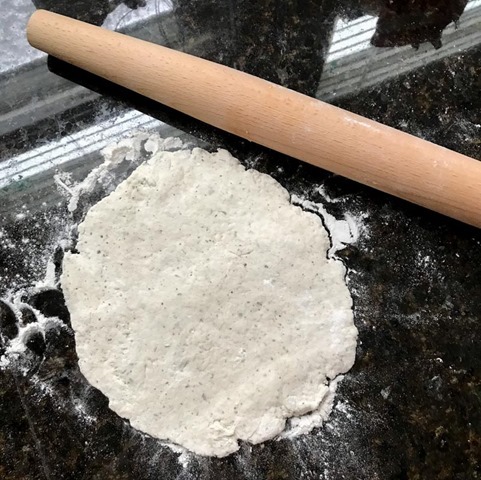 Once the dough is done, liberally flour your work surface and rolling pin, and roll the dough out to roughly 1/4-1/2 inch thick. Line a baking sheet with parchment paper and spray liberally with cooking spray. 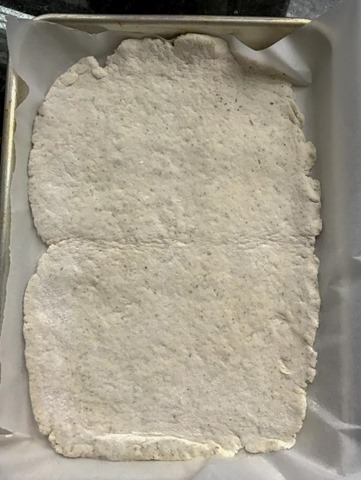 Bake the pizza dough on 400 degrees for 15 minutes. 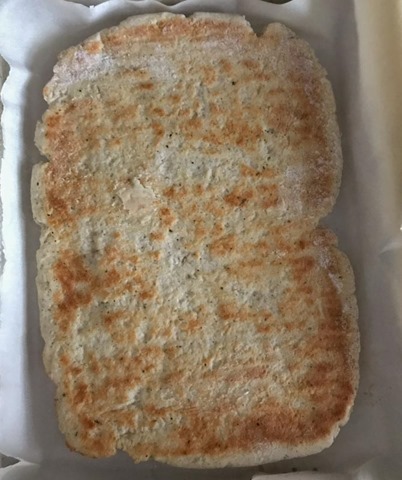 When the first side has browned, re-spray the pan, flip over the dough, and bake for another 10 minutes. While your dough is par-baking, it’s a good time to get your pizza toppings together. Go nuts with whatever you like: cheese, marinara, pesto, veggies, pepperoni, etc. 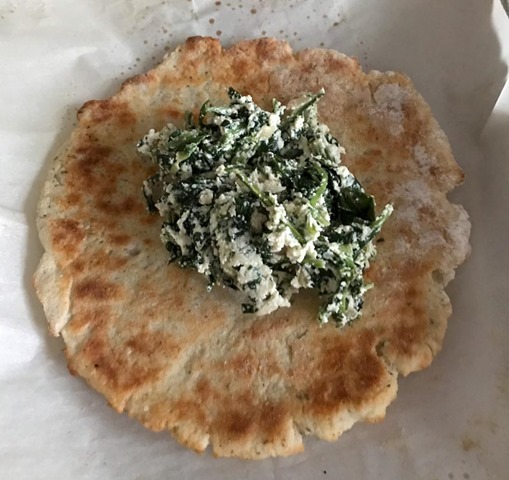 Our go-to white pizza topping lately has been the following creamy spinach, kale and ricotta. 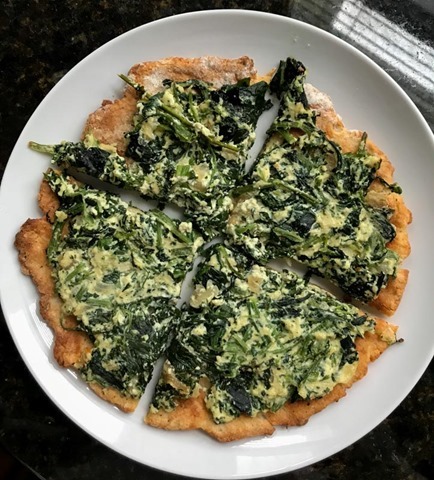 This recipe was adapted from Blue Apron’s Spinach & Ricotta Pizza recipe that we love. This recipe is very simple: saute the onions in EVOO over medium heat until translucent, add the spinach and kale, saute for 5-7 minutes until the kale has wilted, add the garlic, saute for another minute, add the spices and cheese, stir thoroughly, cook together for 3-5 minutes, taste for seasoning, adjust accordingly, and the topping is done. 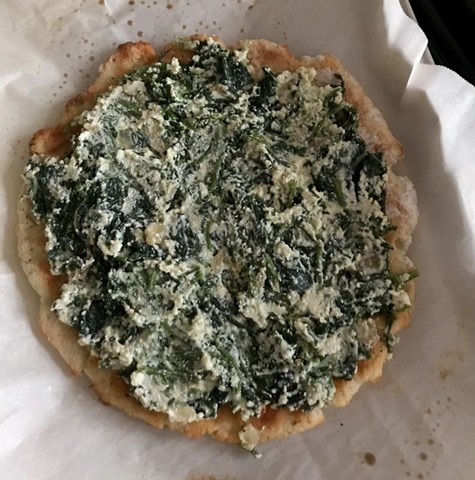 After the second side of the pizza dough has par-baked, flip it over again and top with as much of the creamy spinach, kale, and ricotta as you like. Bake for another 5 minutes. The par-baking is key with this dough. As you can see, if it’s given enough time to par-bake and set up, the dough is golden brown and crispy just like regular pizza dough. Cut up and serve nice and hot! I’m obsessed with everything about this pizza – the dough and the topping! It’s a fun change from the traditional dough we make, with slightly better nutritional stats. 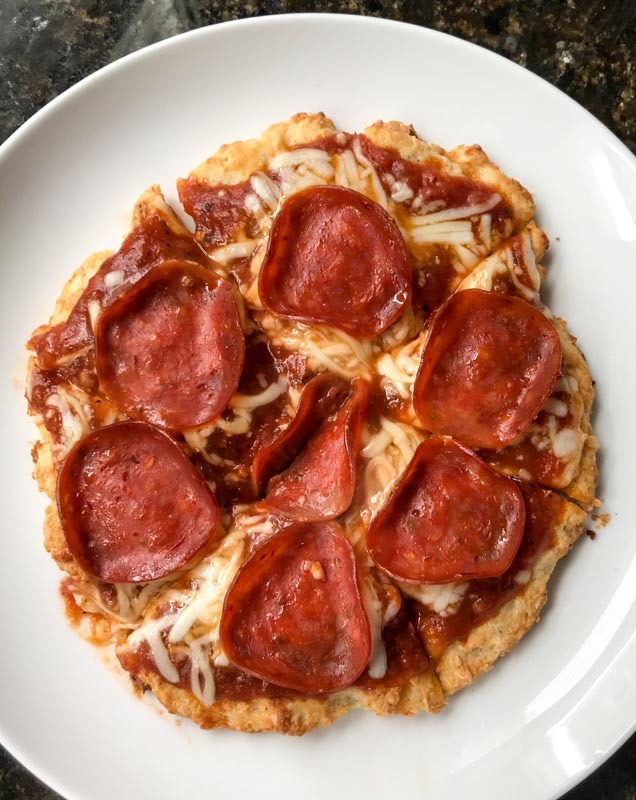 I’m not claiming this is health or diet food by any stretch, just a new spin on pizza that utilizes different ingredients for a new nutritional profile. Try it out! 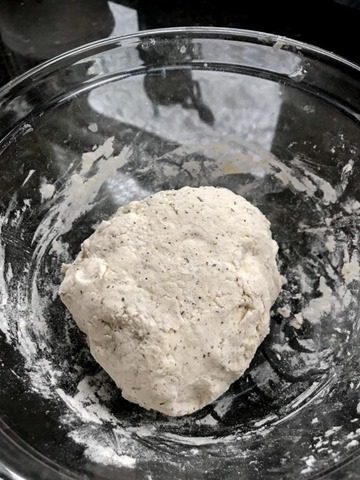 Update 4/15/2018: I’ve made this dough at least a dozen times now and I love it more each time! Here is a pepperoni pizza version I made that came out delicious.